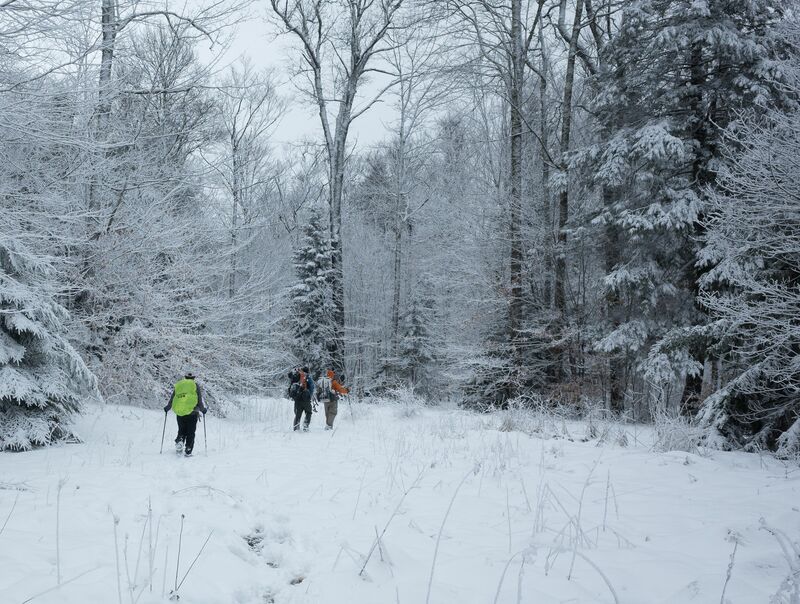 Trying to plan in advance for a snowshoe trip in the Mid-Atlantic is a crapshoot. In this case the weather forecast leading up to the weekend was going to be warm and full of rain. Damn. An unlucky roll for a snowshoe trip. Plan B of finding somewhere else with snow was shot as well, with the rest of the region facing similar weather. On to Plan C for coming up with a typical backpack route in the Cranberry Wilderness. 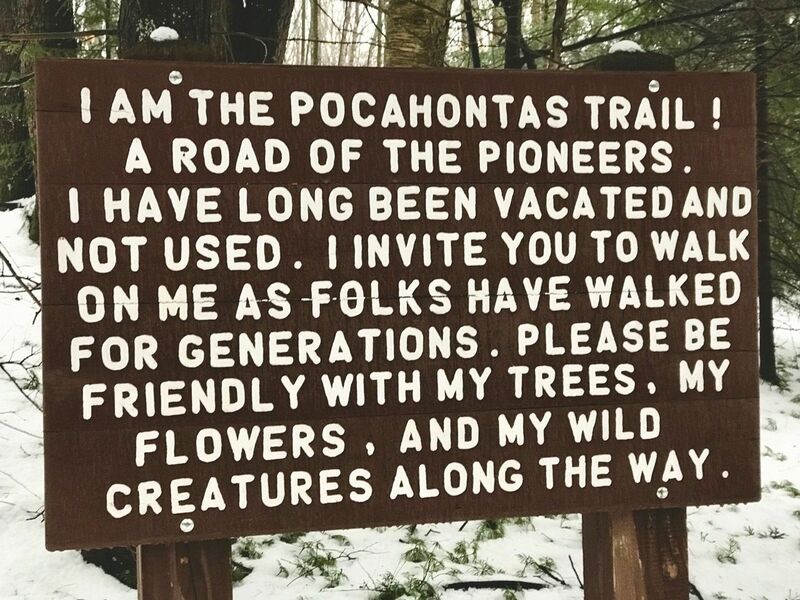 For those not familiar with the Cranberry Wilderness, the main access is on the eastern side off of Rt 150, the Highland Scenic Highway, which isn’t maintained or plowed in winter and so considered closed to traffic. There’s another access point to the northwest off of FR 86 along the Williams River, which defines the northern boundary of the wilderness area. From online materials, this one seemed to be open. With days of warmer temps and rain, it was difficult to imagine there would be much difficulty accessing either trailhead, but the one off Rt 86 seemed to be a safer bet. Plenty of materials available from MidAtlanticHikes and having the trail segments selectable in CalTopo made it easy to put together a route suitable for DC UL. A few days before the trip and the weather forecast started turning colder, calling for a wintry mix on Saturday just as we would be getting to the trailhead. 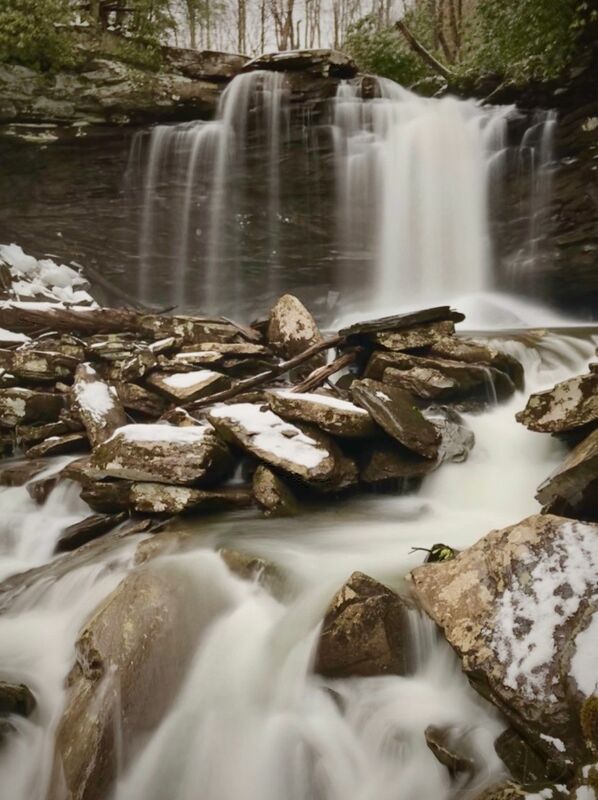 A call into the Forest Service office resulted in the standard safety talk to avoid both 150 and 86, as it turns out neither are actually maintained, and a strong recommendation to access the area from the maintained Rt 39 to the south. On to plan D and doing the trip to the south of the Wilderness in the Wildlife Management Area. There were a few midatlantichikes.com resources, although with a lack of pre-defined camping areas easily allowing for good splits, and no selectable CalTopo trail segments, meant pulling up the USFS 2016 layer and drawing out a route by hand. 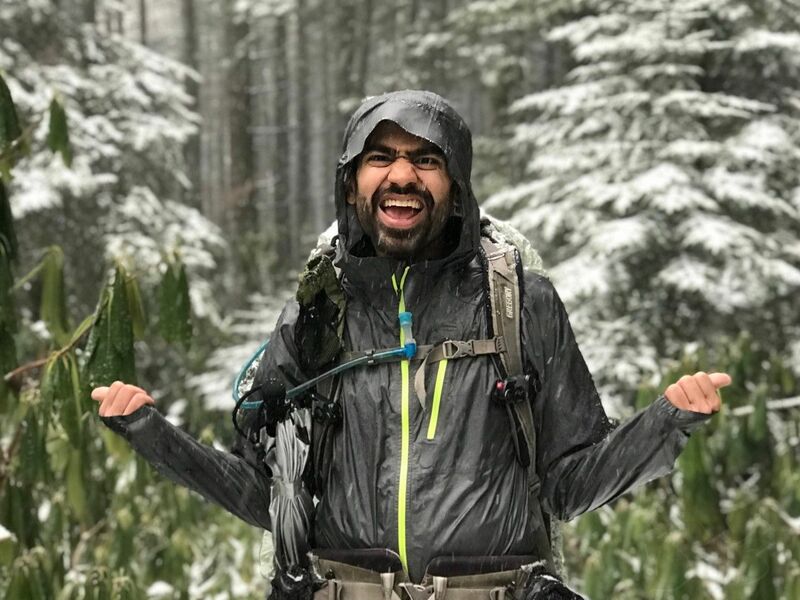 I learned to make sure to save my CalTopo map early rather than expecting it to still be cached when I came back to it later, and learned my way around the Forest Service maps and quads available online. A good bit of work resulted in an interesting route that minimized any fording we would need to do and included a few options in case things went awry. With a weeks worth of rain and a flood warning ending Friday night before the trip, any fords were going to be high and potentially challenging, so having options would be good. There was already an inch or so of snow on the ground as we drove up Rt 39, but the snow plows were out doing their thing and Karan had the Subaru in low gear, so we were all set getting to the trailhead. We parked, geared up in the midst of the wintry mix and set off. The mix turned to all snow as we climbed further up Kennison Trail. Our feet were soon soaked by the damp snow, but the snow made everything beautiful and we were having a great time. 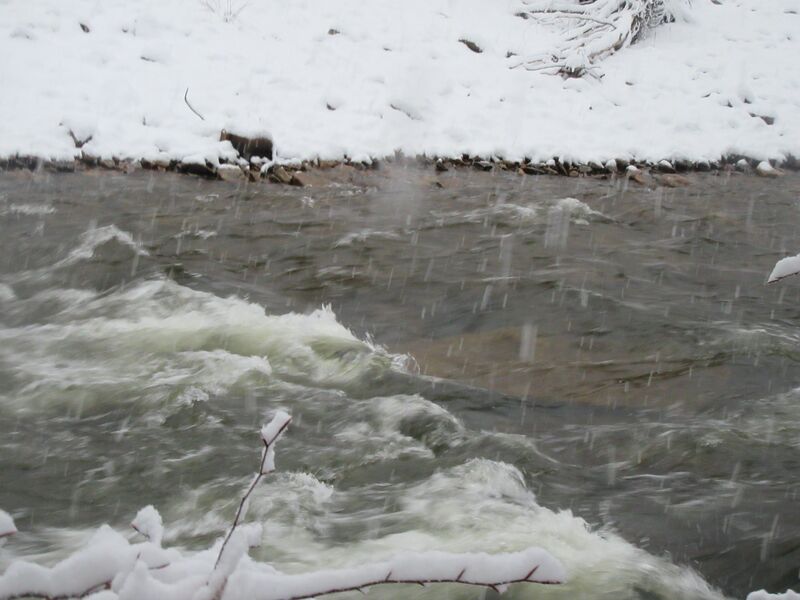 The fact we were getting snow was also lessening some concern about the ford of Cranberry River in the itinerary. At least we weren’t getting a bunch of rain swelling the river even further! The snowy miles along the ridge top were relatively easy walking. We seemed to be making decent time considering the snow, which was hitting 5-6 inches by this point. We neared, then passed, the point where the forest service map indicated there was supposed to be a trail leading down to an old forest road that crossed the river. After a bit of scouting the woods, checking the gps, and referencing the quads, it seemed like the planned trail was a map holdover that just hadn’t been removed yet. Good thing I added in an alternate option for the end of the day, but now it meant we were going to have to ford Cranberry River at a trail crossing rather than a road crossing, which would have either had a bridge or at least been wider and shallower than other fords. We descended to the Cranberry and found the spot on the map where the ford was indicated. A bit of searching up and down didn’t reveal a better spot, so we set ourselves to getting ready to ford. We were on the outside of a long bend in the river, so nearest the heaviest flow. I started across and within a matter of 3-4 feet was in a strong current with water over my knees that was only getting a deeper. I retreated back to shore to rethink. “We’ve already been having an adventure, we don’t need to make it more than an adventure” declared Andrew. So in spite of a shelter on the opposite side of the river, the rest of the crew agreed to not attempt the ford. Finding what flat space we could, we set up camp as the snow turned back into a wintry mix. 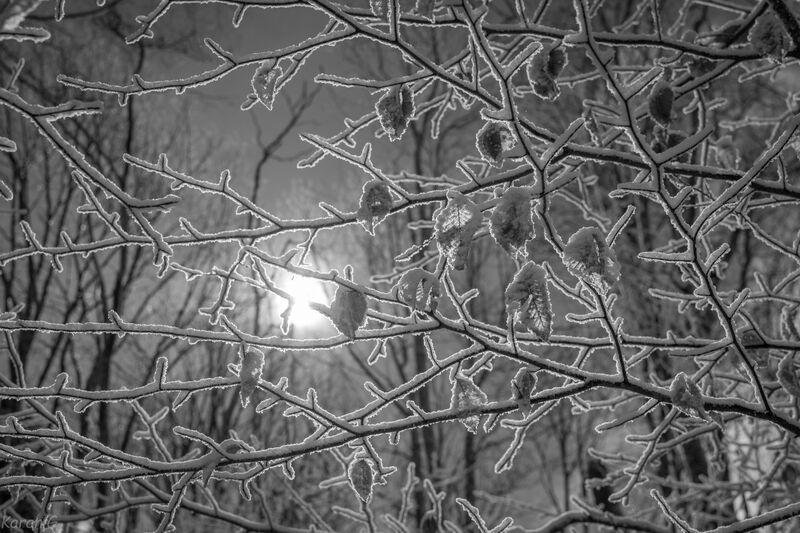 The precipitation had stopped prior to all of us heading to bed the night before, but resumed overnight, knocking snow off the trees and bringing freezing rain that left a layer of ice covering our shelters. 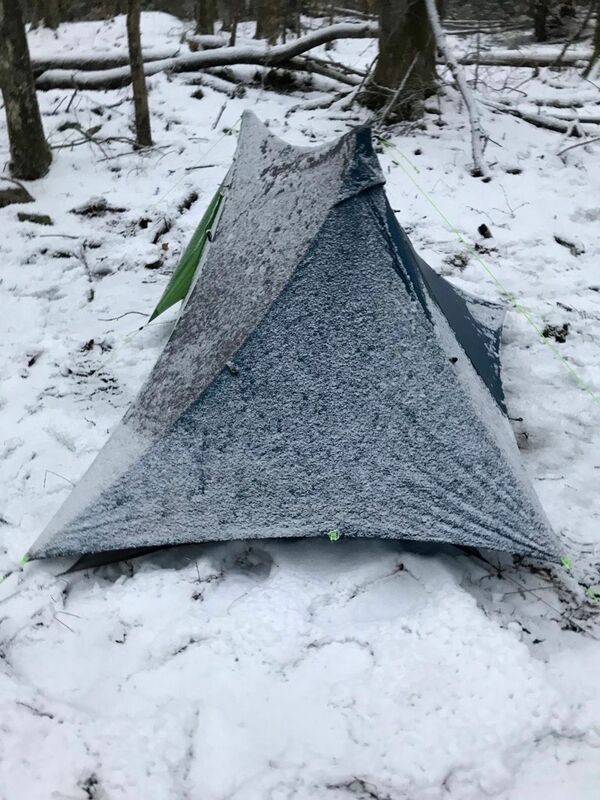 I’ve always had snow slide right off silicone treated tent fabrics before and never had freezing rain that stuck like this did, so having to scrape off my shelter in the morning was a novelty. No one was particularly looking forward to attempt a ford in the morning, so a huddle was formed around the maps to come up with options. (It had to at least be Plan E by this point, maybe we were on F. I don’t know, I was starting to lose count!) Without the ford in play, the best option seemed to be backtracking most of what we hiked in on and doing a shorter loop back to the car. 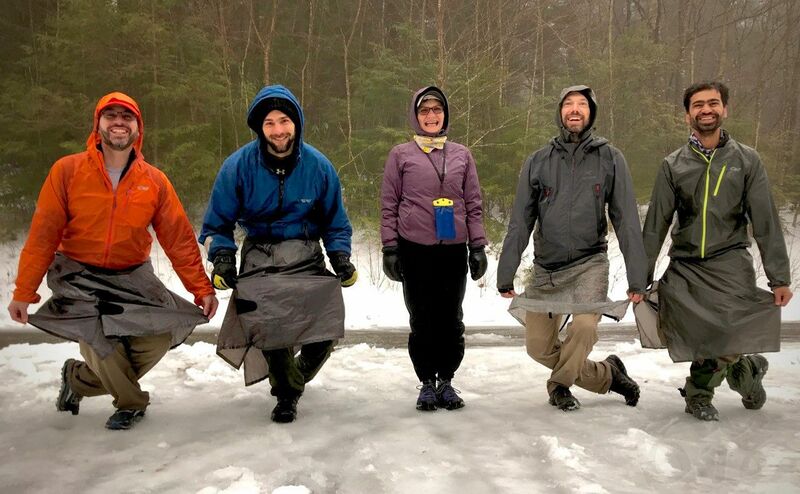 With rain in Monday’s forecast, there wasn’t much excitement about doing miles in a few inches of slush, so the consensus was to make Monday a shorter day than originally planned. I don’t typically like doing an out and back, but with the overnight precipitation and winds, things looked completely different on the way back out. Folks were taking their time and grabbing some photos. Double Puff had had some issues with her tent fly and sleeping bag getting wet, so she opted to head back to the car to dry it off and then maybe do something really short nearby. The rest of us hiked west on the Frosty Gap Trail (one of those forest road they refer to as a trail). We saw a truck parked at the gate with a set of boot and paw prints, the only other person we’d run into over the weekend. 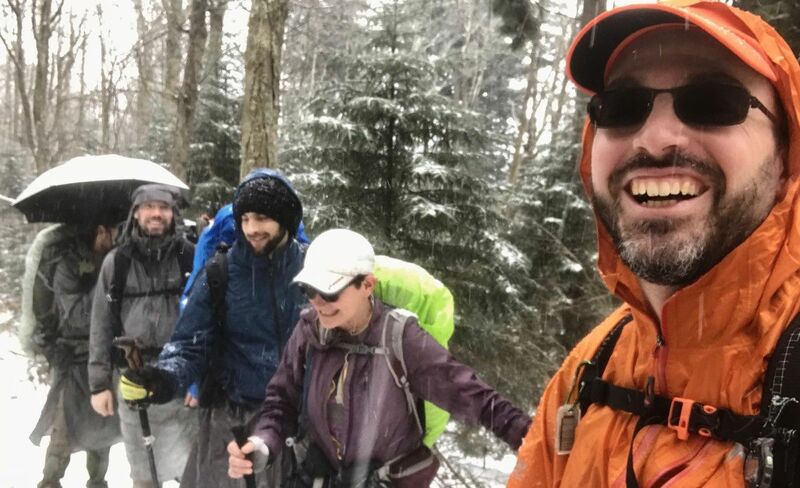 The sun came out, the snow kept getting wetter, and we finally joined up with the Pocahontas Trail. We couldn’t find the camping spot marked on one of MidAtlanticHikes maps near the stream crossing, so again we settled for what flat space we could find. 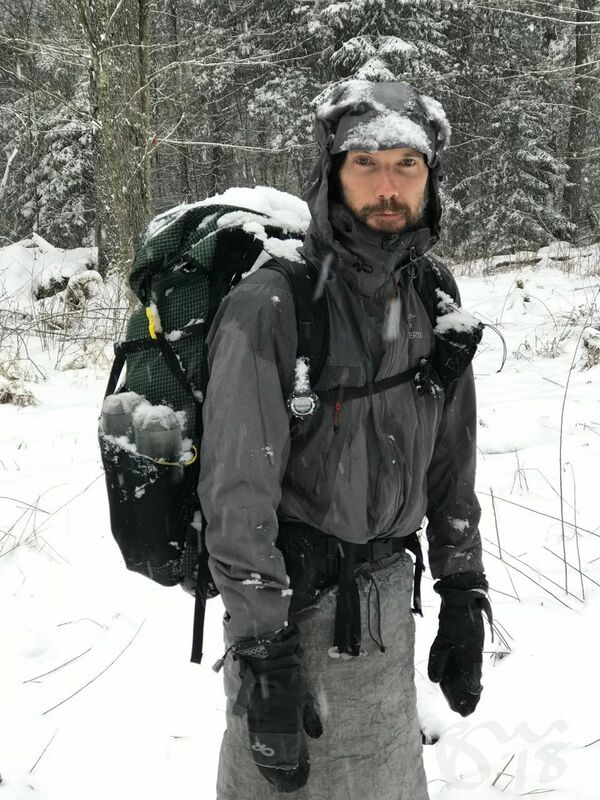 Monday’s rain was supposed to start overnight, and with camping on snow, near a stream, with rain and temps in the mid 30ºF, it brought with it the worst condensation I think all of us ever experienced. I woke up to spritzing on my face and my quilt covered with small water droplets. I wiped down the fly and went back to sleep. The rain had mostly dissipated by the morning, so we were able to pack up easily and hit the trail. Less than an hour brought us down to the road and then the car. 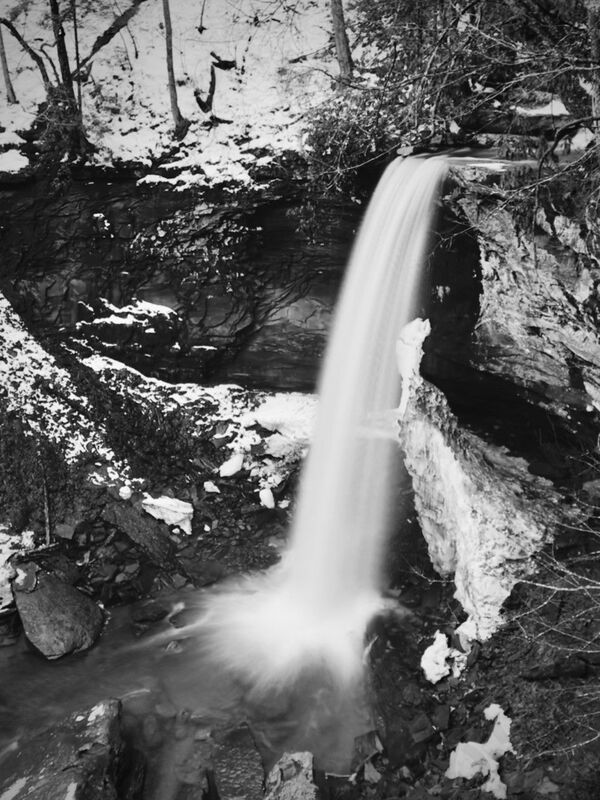 We hoped in and drove down a bit to the Falls of Hills Creek. Hiking all the way down to the lower falls and back, taking pictures the whole way, what totally worth the hour or so that it took. A great way to end a trip. So the Wilderness remained untouched this trip, but it certainly left a calling that I think most of us will likely come back to for a visit sometime soon.